This article originally ran in the Air Capital Carnival Glass newsletter. Used with Permission. Because carnival glass light and lamp shades are still relatively inexpensive, attractive, and easy to display, and unlike most carnival glass can be used as intended without much risk of damage, I consider them an ideal collectible. Unfortunately, they represent an area of collecting about which very little information is available. The lack of resource material has often made collectors reluctant to acquire carnival shades. Since I now have a fair number of shades in my collection, I thought I might share what I’ve learned – – from a variety of resource books, and personal experience. Carnival Glass lamp shades were produced during an interesting period in history, when our country was making the transition from gas to electric lighting. 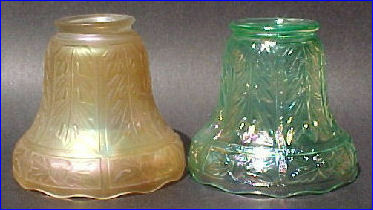 As a result, shades for both gas and electric light were produced. Some of the patterns were those used for other carnival shapes, and some were unique to shades. A given pattern was usually produced in a variety of shapes and colors. 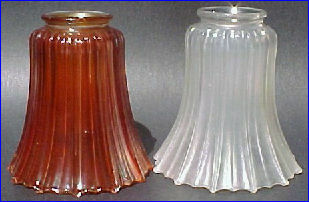 On occasion, two or more companies produced nearly identical shades, for example, Fenton’s and Northwood’s – Pillar and Drape. Carnival shades are well suited for use on student type lamps, or as replacements for the relatively drab shades on many of today’s ceiling fans. Although most collectors would probably opt for a matched set, some, like me, might settle for shades with the same pattern, but different colors, or perhaps shades of the same color, but different patterns. The three major producers of carnival shades were Imperial, Northwood, and Fenton, in that order, with Imperial producing a greater variety than the other two combined. 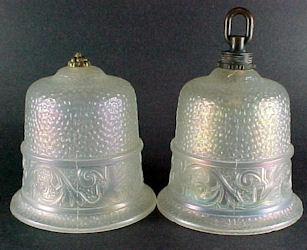 Imperial’s initial production of carnival lamp shades was restricted to three colors, i.e., pearl white, pearl green, and pearl ruby (white, green and marigold). Clam broth, amber, and smoke were added later. 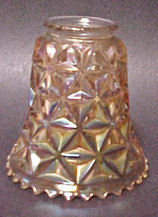 The base glass was either crystal, or a semi-opaque white which they called “Pura”. At least 24 different patterns were used. Many bear Imperial’s NUART trademark in block letters around the fitting collar. Roughness on the inside of the fitter is common, because the opening was filed rather than reamed – it does not represent damage although it is not unusual to see it identified as such by the seller. Imperial’s #575 is an unmarked, fairly slender, on slightly flared shade. It measures 4 7/8 inches in height, and was made only in the electric style. It is known in marigold, and a frosty white. The pattern consists of 12 slender, vertical ribs that extend slightly beyond the bottom edge, and 12 interspersed slightly narrower and shorter ribs that end at the bottom edge. Imperial’s #583 is marked NUART, and is a tall, almost cylindrical shade with straight sides, and minimal flare. It was made only in the electric style, and in marigold, clam broth, white, and green, some with hand cut designs. The shade in the photo is clam broth, which permits the 36 vertical, internal ribs to show through. The smooth external surface has an etched/frosted grape and leaf pattern. The shade measures 5 1/8 inches in height. It is iridized on both surfaces. August Flower was Imperial’s #486, and to the best of my knowledge was a pattern not used for other carnival. The raised floral pattern occupies most of each of the three stippled panels on the electric shade, and the four on the gas version. The bottom of each shade is slightly ruffled, with a faint saw tooth edge. Both surfaces are iridized. These shades are known in marigold, clam broth, green and purple, the latter rare. The electric shade measures 3 3/8 inches in height, the gas shade 3 7/16 inches. Note: Electric shades on the outside – gas shade in the middle. This is another pattern I believe is unique to lamp shades. As far as I know, only the electric shade was produced. The pattern consists of 6 panels of acorn and leaves around the slightly scalloped bottom, and six vertical panels, each with an elongated acorn leaf. The shades are iridized inside and out, and known in marigold and a frosty white. The shade was reproduced in the 1970’s, in meadow green (see right photo). The base was left in, and it was sold as a vase. This Imperial shade has a stippled and frosted outer surface with a Buzz Saw imitation cut design. It is known in marigold, a honey amber-like color, green, white, and smoke. They are iridized on both surfaces. There is a beaded, cut spear design around the top, 9 short ones over each buzz saw, and 2 long ones extending down between the buzz saws. 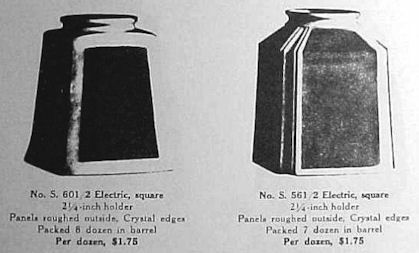 Three different sizes are shown in an old Imperial catalog. The white shade in the photo measures 4 ½ inches in height. This is another of Imperial’s NUART shades. It was made in the electric style, and is known in a pale marigold. The pattern consists of six wide, stippled panels separated by a narrow, slightly raised, clear rib that extends from the fitter to the faintly serrated bottom. It measures 4 inches in height, and is iridized inside and out. This was Imperial’s #544, and was made only in the electric and cluster electric style. The name Colonial comes from an old Imperial catalog. The pattern consists of 12 wide, vertical, exterior panels. The bottom is scalloped. 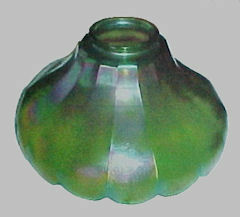 The shade measures 3 ½ inches in height, and is known in marigold, white, green, and smoke, all iridized inside and out. A large, 11 inch, cluster electric Colonial shade in emerald green with bluish iridization was offered for sale on eBay in Aug., 2002. I wanted it in the worst way, but grossly underestimated the selling price ($375.00). 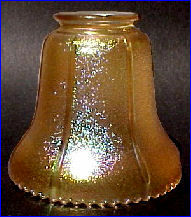 An identical shade (or perhaps the same shade) is shown on page 285 of Carwile’s Encyclopedia of Carnival Glass, 11th edition. He described it as “one of the most beautiful light shades” he had ever run across. The cluster electric version is shown, paired with a smaller electric shade, on page six of the Archer’s Blue Book, both sizes with a matching sand-blasted floral design. 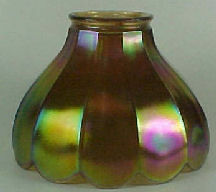 This is another NUART shade, made in both the gas and electric styles. It has a stippled external surface with 6 narrow, circular, and 18 vertical ridges that divide the surface of the shade into 6 encircling rows of small blocks. Each block has a 1/8 inch, elevated square in the center, The vertical ridges extend down beyond the squares to near the scalloped, serrated bottom of the shade, each ridge ending there in a 10 pointed “daisy”. The shade measures 4 7/8 inches in height. It is iridized inside and out. This was Imperial’s # 699, and is a pattern originally called Mount Vernon. 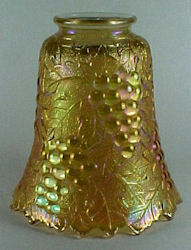 Although it was made in many different, non-iridized shapes, iridized pieces such as the shade are scarce. Only the electric style was produced. It measures 4 ¾ inches in height, and is known in a light marigold, typical clambroth, a frosty white, and smoke. They are iridized inside and out. There is a smoke version, with the base still in place. It was presumably sold as a vase. This is another of Imperial’s NUART shades. It is known only in the electric style, and in a frosty, satiny marigold. 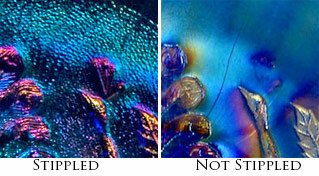 The iridescence is on the inside. As noted by Carl Burns, the pattern is strongly reminiscent of an artichoke. It measures 4 5/8 inches in height. This very simple marigold, four-sided, electric type shade is Imperial’s #601. It bears NUART in block letters immediately below the fitter. 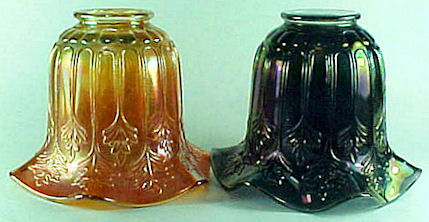 I have only seen three of these shades, all three marigold, and iridized both inside and out. The iridization has been the most spectacular, finely stretched marigold I have ever seen. 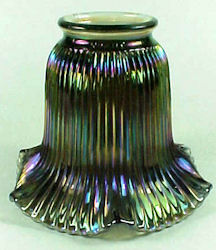 It compares favorably with the iridescence on many of the art glass shades. 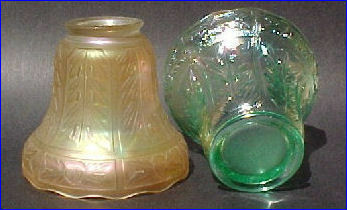 In fact, the first two I encountered were both unmarked, and were labeled “art glass”, maker unknown. The shade measures 4.5 inches in height, and 3.5 inches across the bottom. 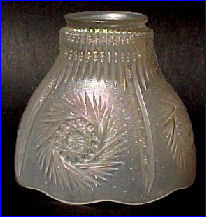 They were produced in marigold, white and green, some with hand-cut designs, either geometric, or with a grape pattern. This was Imperials #561, another of their NUART shades. It is a square, electric shade that looks a lot like the preceding. It does, however, have a narrow vertical groove at each corner. It extends from the fitter down to the base. This shade is known in marigold, and white, frosted on the outside, and iridized both on the inside and out. In the Archer’s Blue Book it is also shown non-frosted, with both cut and sandblasted patterns added. The catalog indicates they were made like that in white, green, and marigold. They measure 4 ¼ inches in height, and 3 1/5 inches in maximum width at the base. The photos, taken from Archer’s Blue Book, show both #561 and #601 for comparison. The first has frosted panel on each side, the second has a hand-cut star in the frosted panel, and the third has a hand-cut grape cluster in the panel. This was Imperial’s # 430. The pattern consists of many fine circular ribs on the outer surface, and many equally fine vertical ribs on the inside. The pattern is very much like Northwood’s Ribbed Spiral pattern. On the Imperial version the circular, external ribs extend to 1/8 inch from the bottom. On a very similar green shade I suspect was made by Northwood, the ribs stop 3/8 inch from the bottom. The Imperial shade was made in both the gas, and the electric styles, and is known in marigold, and helios, both iridized inside and out. They measure 4 ¼ inches in height. This NUART electric shade has 55 slender vertical exterior ribs that extend from immediately below the fitter to the ruffled bottom. I have seen a number of similar, but not identical, fine rib shades, all of them a light to medium marigold, and none of them marked. The shade in the photo is the first and only smoke example I have encountered, and the only on with the maker identified. 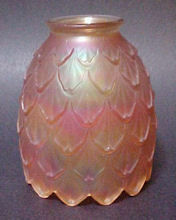 It measures 4 ¼ inches in height, and is iridized inside and out, a beautiful example of Imperial’s multicolored smoke iridization. I am not aware of any gas style shades in this pattern. This was Imperial’s # 591, another of their NUART shades. 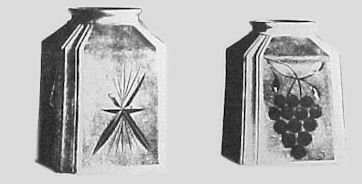 It is frosted on the outside, and has an encircling sandblasted Greek Key pattern, approximately ¾ inches above the gently scalloped bottom. The catalog illustrations in the Archer’s blue book indicate #591 was made in marigold, white, and green, with hand cut, and sand blasted patterns in addition to the Greek Key shown here. They are presumably out there somewhere, just waiting to be found. The shade was made only in the electric style. It measures 4.0 inches in height, and is iridized inside and out. 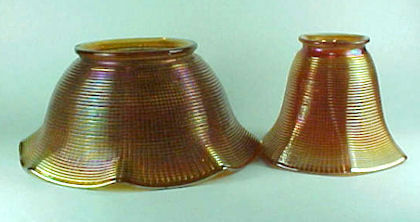 As the name implies, these are bell shaped shades with the surface finely indented, much like hammered metal. They measure 4 ½ inches in height. On the external surface, at about the mid-level, they have a ridge that measures 1/8 inch above the surface. One and a half inches below that ridge is a second similar ridge, 1/2 inch from the bottom of the shade. The intervening area contains a curled plume-like pattern. The shades do not have the usual type of fitter. Instead they are closed at the top. Some have a small metallic, berry-like knob, at the apex. They were intended to fit, open end up, in a ring type holder on a light fixture/chandelier. The other type has a metal fitting with a ring or hook at the top, designed to suspend the shade. The fittings have a central channel for passage of the electric cord. The Hammered Bell shades are known only in a frosty white, a lot like that of the Buzz Saw shade. They are nicely iridized, inside and out. Although these shades have been attributed to Imperial, I have not been able to find them in any of the old Imperial catalogs, or in the Butler Bros Catalogs. They may well have been made as a special order for a chandelier manufacturer since they were obviously designed for specific ceiling fixtures. This was Imperial’s #473, another of their NUART shades. The pattern of grapes and leaves is that used on so many other Imperial Grape pieces. The shade is known only in the electric style, and in marigold. It is one of the hardest Imperial shades to find. It measures 5 ¼ inches in height, and 5.0 inches in diameter at the slightly flared, round, serrated bottom. This pattern was made in both the gas and the electric styles, and is know in white, a satiny frosted marigold, and smoke. The pattern consists of a ring of 18 small, slightly elevated squares that encircles the shade, just below the fitter, and 18 vertical, long stemmed oak leaves, every other one extending to ¼ inches fro the bottom, the other 8 ending 1 ¼ inches short of the bottom. The illustrated smoke shade measures 4 5/8 inches in height and is iridized inside and out. This was Imperial’s #548, another of their NUART shades. It was called Light Optic Flute in the Imperial catalog. It was made only in the electric style, and is known in a frosty marigold, clambroth, green, and smoke. It is fairly smooth on the outside but has 10 faint panels of medium width on the inside. The shade flares slightly toward the round faintly scalloped bottom. The shade measures 5 1/8 inches in height. Versions with wheel-cut designs are known, one with 10 point stars selling on eBay in 2005 for $160.00. 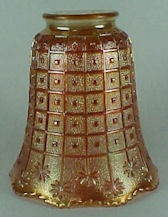 This is another of Imperial’s NUART shades, and like the preceding is identified in the Imperial catalog as Light Optic Flute. It, however, is their #535. It too has 10 medium width panels, best defined on the inner surface. They end ¾ inch from the broadly scalloped bottom. It measures 4 inches in height, and is iridized inside and out. The illustrated electric style shade is a rich, dark marigold with a hand cut design. 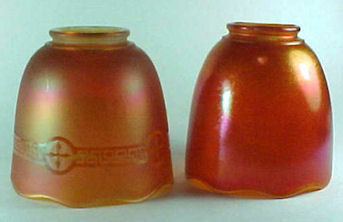 Gas style shades were also produced. According to the Imperial catalog, these shades were also made in white and green. Mayflower is Imperial’s #474, and was made in both the gas and electric styles. The flowers and fern-like leaves, unlike those on Imperials #474 shapes, are in high relief, rather than intaglio, and on a stippled background. The near-cut geometric component is absent. The bottom of the shades is ruffled and fluted. The shades are known in marigold, green and smoke. This was Imperial’s #559, and was made in the electric style in three sizes, some plain, some with the panels frosted and the margins clear, and some with hand cut geometric and grape designs. They were made in white, green, and marigold, iridized inside and out. Each has 6 wide, slightly rounded (convex) vertical panels that end at the scalloped bottom.